The Museum of Fine Arts in Boston is a world-renowned institution housing one of the best art collections in the world. The wide range of captivating, priceless works displayed celebrates the talents of a variety of masters spanning the history of art from antiquity to the contemporary period. The collection encompasses more than 450,000 individual pieces dating from ancient Egypt until the 20th century. The family-friendly museum has several hands-on art programs geared toward children to make their visit fun and exciting. In addition to its permanent exhibits, the museum hosts temporary shows highlighting particular artists, styles and countries along with traveling exhibits from other museums around the world. Founded in 1870, the MFA opened to the public six years later with the majority of its assortment consisting of works taken from the Boston Athenaeum’s art collection. John Hubbard Sturgis and Charles Brigham designed the ornate Gothic Revival-style building on Copley Square that originally housed the MFA. The edifice was easily identifiable by its red brick and imported terracotta facade. In 1907, it was determined that the museum would move to its present location in the Fenway-Kenmore section of Boston. Guy Lowell was hired to design a building that could be constructed in stages as funds became available. The first section of the neoclassical building was completed in 1909. The building featured a grand rotunda and a 500-foot-long granite facade. A new wing was added six years later that overlooked The Fens. From 1916 until 1925, noted artist John Singer Sargent produced the frescoes that adorn the colonnades, walls and ceiling of the rotunda. The Decorative Arts Wing was added in 1928. While I. M. Pei designed the West Wing that opened in 1981, the most recent addition, the Art of the Americas Wing, opened in 2010. From the core of paintings and sculptures once contained in the Boston Athenaeum, the collection has grown to include works by John Singleton Copley, Winslow Homer and John Singer Sargent. The second-largest museum collection in the world also features pieces by Gilbert Stuart, Fitz Henry Lane and Edward Hopper. The museum is home to a wealth of works by native New England artists, folk art and colonial portraiture as well. There are fine examples of abstract impressionists from the mid-20th century. The collection includes Egyptian artifacts along with French impressionist and post-impressionist works by Gauguin, Renoir and Manet as well as Van Gogh, Monet and Cezanne. There is an impressive array of Chinese and Japanese works. Notable works include John Singleton Copley’s portrait of Paul Revere, the unfinished portrait of George Washington by Gilbert Stuart and Apollo and the Muses by Claude Lorrain. The museum houses the 13-foot-tall Juno, the country’s largest classical statue. You can journey through time from the first millennium B.C. to the 20th century as you explore the various galleries and exhibits. If your time is limited, browse the main central galleries of each wing. The side galleries and exhibits offer a more in-depth study of unique artists, periods and styles. The Museum has several featured galleries. The Art of the Americas Wing displays works from the pre-Columbian period until the end of the 20th century. The Art of Europe includes masterpieces from the Middle Ages through the mid-20th century, especially the works of 17th-century Dutch and Flemish painters. The Art of Asia displays various works, including paintings, sculptures and ceramics dating from 4000 B.C., which reflect the culture of China, Japan, Korea and parts of Southeast Asia. The Art of Africa and Oceana Gallery reflects on the artistic creativity of the indigenous people of these areas of the world with its collection of bronze figurines and tribal masks. The Art of the Ancient World features a range of antique artifacts that date as far back as 6500 B.C. There are works of art from Egypt, Greece, Rome and Nubia. The Contemporary Art Gallery highlights works produced by artists after 1955 like Kathy Butterly and Andy Warhol. In addition to prints, drawings and photography, there are also galleries dedicated to musical instruments, textiles and jewelry. The musical instruments come from around the world and range from ancient times until the 20th century. Textiles on display include haute couture fashion, needlepoint embroidery and tapestries as well as Middle Eastern rugs and African Kente cloths. Featuring Egyptian broad collars to contemporary studio pieces, the jewelry collection comes from almost every culture. The Printing and Drawing Collection is one of the finest in the world with works dating from the 15th century as well as an extensive grouping from the American Civil War. MFA was one of the earliest museums to collect photographs. There are works by Alfred Stieglitz and Georgia O’Keefe. The MFA is located on Huntington Avenue. Opening at 10 a.m. each day, the museum closes at 5 p.m. Saturday through Tuesday and remains open until 10 p.m. Wednesday through Friday. The MFA is closed on Patriot’s Day, which is the third Monday in April, July 4, Thanksgiving, Christmas and New Year’s Day. Crowds are most prevalent on holidays and school vacation weeks. Children under six are admitted free of charge. Those aged 7 to 17 receive complimentary admission during non-school hours. You are asked to stay at least 1 foot from the artwork and to only eat and drink in designated areas. To reach the museum, hop aboard Old Town Trolley for a sightseeing adventure around Boston. 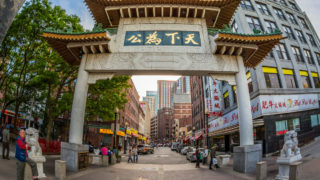 Get off at Stop #10 to visit the museum and see everything else Beantown has to offer as you travel to 18 other stops. Situated along multiple bus routes, the MFA is also easily accessible by the T, Boston’s subway system. You can use the Museum of Fine Art stop on the Green Line or the Ruggles stop on the Orange line. Self and valet parking options are limited near the museum. The Fens, also called Back Bay Fens, is a parkland and urban wild established in 1879. It was designed by Frederick Law Olmsted as part of the city’s Emerald Necklace of green spaces. The park is home to a variety of memorials and monuments as well as landscaped gardens and public artworks. The Victory Garden is one of only two remaining in the country that date back to World War II. Because of its renowned acoustics, Symphony Hall is one of the top concert venues in the world. The concert hall was a collaborative project between Harvard physics professor Wallace Sabine and the architects McKim, Mead and White. Featuring Roman and Greek statues, it is home to the Boston Symphony and Boston Pops orchestras. The Isabella Stewart Gardner Museum was started by its namesake in 1903. A patron of the arts, Gardner commissioned the museum, which is styled after a 15th-century Venetian palazzo, to house her growing collection. She chose the open, natural light design with garden views to make the museum more inviting. Covering three floors and the garden courtyard, the collection of paintings, sculptures, furniture and decorative arts from around the world covers a period of more than 300 years.